It was a Thursday. I’d just come home from my morning job and had three solid hours to be productive before my next gig. So after a bag of Pop Chips and three episodes of Community on Netflix, I dozed off. I was lying on my right side with my head on the very tall arm of the sofa. My head was essentially tilted 90 degrees to the left. And in that position I remained for an hour and a half. For three weeks, I could neither tilt nor turn my head to the left. I don’t remember when my neck immobility and the tennis-ball sized knots under my shoulder blades turned into the sensation of lightning bolts shooting from my thumb and index and middle fingers (by the power of Grayskull). But that happened. And continued happening whenever I looked down. Writing? Zing! Treating patients? Zing! Right now as I type this? Sip. Zing! Sip. 8:44 pm – eating my anxiety: cold left-over spaghetti sauce. I hope they don’t cut my nose ring out. For the record, an MRI sounds less like “a basketball being dribbled” (as I was forewarned) and more like the intro beats of Martin Solveig’s, “Hello” looped one-hundred and eighty-seven times. Also, if you need to get an MRI, keep your eyes closed the entire time. It doesn’t matter how curious you get 15 minutes in. Keep them closed. Open them only when you hear the voice over the speaker telling you you’re done and you feel your gurney (it’s likely not called a gurney) start to move. Also, if you’ve got someone driving you, I’d recommend 2.5-3 glasses of red wine before the procedure. To relax. They didn’t take my nose ring out but warned me that metal tends to heat during an MRI so if my nose starts searing while I’m deep inside the cold, unforgiving cocoon (I’m probably paraphrasing), I can squeeze the panic squeezer and they’ll have me out in the quickest of jiffies. This totally helped me not panic. For real, they found the disc herniations and nerve root impingement in my neck that I’d predicted (based on my numb fingers). But they also found a mysterious “syrinx” (I wish it was as cool as it sounds) – a fluid-filled sack – in my spinal cord. Now, I may be a Physio, but I don’t claim to be any kind of expert. Far from it. But I’m preeeeetty sure you shouldn’t have a big ol’ 3.5 cm (yes, centi-, not milli-) diameter sack in your spinal cord. 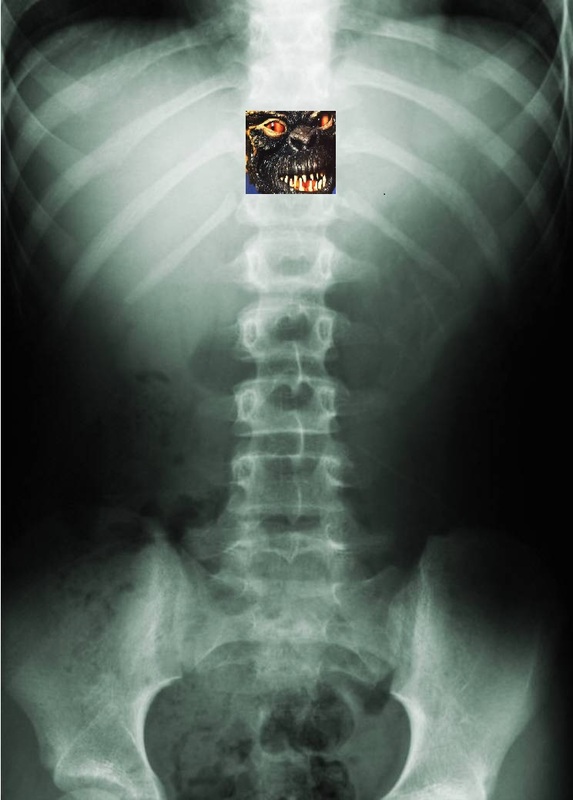 Anyway, operating at Defcon 1, the Radiology department has already booked me for a follow-up MRI, with a featured close-up of my sac-o-business. They also want me to see a Neurosurgeon. My doctor wants me in ASAP to discuss my first MRI, not knowing that I’ve already read it and, in fact, named the sack. That’s what friends are for. And yes, it would be hilarious. Google suggests only the worst so I’m opting to boycott that. A patient suggested, “That’s easy, they can just get in there and pop that sack!”. And my fellow Physio colleagues think it’s probably just an anomaly. And agree that the word “sack” is funny. Either way, we shall know soon. Nothin’ like a big ol’ sack to make you all-the-more aware of your mortality. I’ve been putting in double-time at the gym to get as strong as possible. And I find myself worrying less about the silly things. I really hope it doesn’t have teeth. Previous Previous post: Fond Recollections of…Oh My God – Squirrel! Heather! Another great blog…thoughI’m mildly disturbed to hear of Maybel’s (uninvited) visitation. I’ll keep you in the white light and send positive energy your way until we hear that this is nothing to worry about. “They” say that the power of positive thought really works, so lets go with it. Smooches from the Rock. Awesomeness!!! Great blog! I do hope though that your Maybel turns out to be nothing! You are too funny! Loving your blogs! !